There is a math war between on the one side “realistic mathematics education” (RME) also known (for the present purposes) as “reform” and on the other side “traditional mathematics education” (TME). I take a third position: decent science (DS). In Holland this math war is particularly dirty. The scientific approach is maltreated by adherents of both RME and TME. In Holland, RME is given by the Freudenthal Head in the Clouds Realistic Mathematics Institute, and such a TME adherent is Jan van de Craats (UvA) with his SGR foundation. The following gives a graphical display of the various positions, to clarify how people get lost when they replace science by ideology. While we use the label ME this actually also includes ME research. My position of decent science may also be called “neoclassical mathematics education” (NME). The first step is to observe that both RME and TME actually don’t do mathematics but create so-called “mathematics”. When you repair this, then you get “classical mathematics education” (CME). This CME however is not very didactical. The next step is to re-engineer CME into a form that is didactically acceptable, which gives NME. The earlier weblog article on the power void in mathematics education puts RME, TME, CME and NME into a table. The standard example is 2½ (RME, TME), 2 + ½ (CME) and 2 + 2^H for mathematical constant H = -1 (NME). In the 1950s teachers concentrated on teaching, and it were academics who trained the teachers who developed the RME ideas how things could be “improved”. It was only when RME was imposed on education, and education started failing, that TME came up as a defence. An example is the defence by the New York City HOLD group. In the 1950s mathematics education research and training became more and more institutionalised at the universities. These academics were oriented on “theory”. That is, they created texts that claimed to be theory. But they looked less at practice and they hardly collected data. A scientific theory must be developed w.r.t. data, and thus RME cannot be seen as a scientific theory, and only counts as ideology. This conclusion may sound a bit harsh, but check out the English Summary on p10-16 of the 2009 KNAW report (pdf) on the empirical base in research on education in arithmetic in Holland. My problem with the report is that it likely neglects the relation of arithmetic to algebra (see here too), so that it downplays the importance of TME over RME. Obviously, the report also neglects my 2008 paper (see here in Dutch). PM. One can imagine RME as a philosophy of education, but philosophy also looks at different views. This also explains that RME has a lot of texts and that this situation suggests a consistent body of claims, while TME consists more of simple rules and lines of defence. It seems as if TME is less developed while RME might appear to be attractive since it has such a body of texts and authors referring to each other. But we are comparing apples and oranges. Ideology does not quite compare with empirical science. For Holland, there is also the Freudenthal fraud and disaster. The International Mathematical Union (IMU) has a committee on education (ICMI). They have created a “Freudenthal Medal” as a reward for mathematics education researchers. The 2015 medal has been awarded to Jill Adler. I wrote to IMU / ICMI in 2014, but they have not responded till now, and we may fear that they did not inform professor Adler about the discovery of the fraud. Mathematics teacher Pierre van Hiele (1909-2010) observed in practice that students showed levels in insight. He presented in his 1957 thesis a general theory of levels of insight, with suggestions how education can help students to move from one level to the next one. He used geometry to demonstrate this, but said explicitly that the theory applied also to other areas of knowledge. His work can best be seen as NME. He investigated the use of 2 + 2^(-1). My suggestion to use H = -1 is an improvement on this. Using -1 directly suggests to students that they must do some calculation, which is distractive. Instead, 2^H indicates the inverse value of 2, which is precisely what is needed, with the rule that 2 2^H = 1. Mathematician Hans Freudenthal (1905-1990) was the thesis supervisor of Van Hiele. Freudenthal lectured mathematics at university and had hardly training and practical experience as math teacher for other levels of education. Apparently he put in hours in looking at such practices, but we can diagnose that he remained an abstract thinking mathematician and that he did not develop into an empirical scientist. His wife supported the Jena-plan schools, and may have influenced him in preferring understanding above drilling. Unfortunately, he stole ideas by Van Hiele, and distorted them, and abused his position as a professor to take the limelight. Freudenthal presented his RME and blocked the development of NME. We can make a first graph on the difference between RME and TME w.r.t. cause and effect in the relation between insight and skill. These notions meet with difficult questions on measurement, on which RME and TME may not agree. When insight is defined as “problem solving skills” then we must distinguish between different kinds of skills. The following remains a sketch that is targeted at understanding the difference in reasoning. RME holds that students should understand issues much deeper than TME are willing to accept before they should be trained. Potentially this order might be reversed, like in behaviourism with Pavlov reactions, but doing so would not be educational (in the long run). Thus in the RME View, insight (grasp) drives the subsequent skill. RME will not drill on the tables of multiplication and on long division. By working with insight on sums, the required skills will sink in over time. There might be a trade-off, with little grasp causing little skill and a high grasp on theory with little practical skill (the distracted professor). It is not required to target for the highest level of skill. The TME response is that this is too simple. It is obvious that exercises better be preceded by an introduction. But the introduction would be shorter than with RME. Once you understand what addition and multiplication are, you still have to exercise on tables of addition and tables of multiplication, and learn to know those by heart for the numbers 1-10. You must master long division for later algebra (e.g. divide x^2 -1 by x – 1). There are different levels of insight. At some point the development of skill can help to arrive at more insight. At some point training (like training to the test) can reduce understanding, but this doesn’t devalue the other notions. TME will have less assumptions about the form of the graph, and for simplicity I use a similar form. When we assume that the notions of insight and skill are measured in the same manner for both RME and TME positions, then we can combine above graphs. We indicate the tops of curves by labels T (TME) and R (RME) only to help distinguish them. Potentially, the curves can still be everywhere, either be distinct (left graph, T on the left of R) or overlap (right graph, T on the right of R). 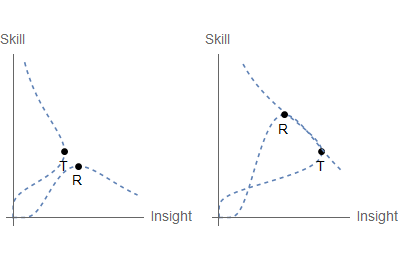 Overall, RME claims that it can be superior in insight than TME, with the graph extending to the right of T.
When the notions of insight and skill are measured in ways that we can agree upon scientifically, then it may also be that these processes like “too much training on skill destroys insight” or “too much time to develop insight destroys skill” take a special form. 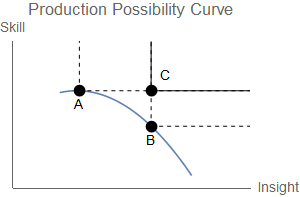 An economist is reminded of the Production Possibility Curve (PPC). Production factors like time and energy create both insight and skill, with a concave trade-off given by the PPC through the points A and B. In the philosophy of RME there is A = T and B = R, so that the TME might have perhaps more skill but at the cost of insight. TME holds that the RME claim is false: RME might succeed in doing more context sums A = R (drilling that isn’t called drilling) but with little mathematical insight B = T.
Of relevance is point C. This point is given by neoclassical mathematics education (NME). This point gives more skill and insight than both A and B. Whether RME or TME is at A or B does not really matter, because C is always better. This position of NME has not been proved empirically yet, but follows logically from its removal of crummy “mathematics”. The argument of this weblog text is quite simple. NME beats RME & TME. Curiously RME & TME neglect NME, or attack it in ad hominem and not at rem manner. Dutch readers can check my letter to parliament. There is no reason on content for RME & TME to neglect NME, since NME is better than both on both insight and skill. That RME rejects a better analysis can be understood from RME’s genesis as an ideology. Ideologues like Koeno Gravemeijer are not interested in empirics but in writing about their ideology. That TME neglects a better analysis can be understood from its focus on RME, but also from the property that mathematicians are trained in abstraction and not in empirical science (which also caused the RME disaster). The empirical operationalisation of insight and skill and the production factors that cause them will help to put flesh on these graphs. This will reduce the impact of ideology, and will shift the focus to competence in research (see the failure of psychometric research w.r.t. arithmetic and algebra). Radar TV is a consumer awareness programme, with Antoinette Hertsenberg in the role of Ralph Nader. Hertsenberg is annoyed that banks rule supreme again. Banks caused the 2007+ economic crisis and should have been tackled, cut up into pieces and put under surveillance. None of this happened, and we are heading for the next crisis. Radar TV had two broadcasts in 2015 about borrowing and debt repayment, and then on January 14 2016 had a third event, a college / lecture, with presentations by three “experts” followed by discussion with the audience. Unfortunately, the “experts” were no real experts: Dirk Bezemer, Klaas van Egmond, Gerhard Hormann. A major problem is that economist Bezemer and engineer Van Egmond repeated the disinformation that they already committed with respect to Dutch Parliament in 2015. I reported on this in November 2015. Thus, Bezemer & Van Egmond have learned nothing and continue disinforming others. PM. Some email-exchange on this with Van Egmond is included in this report, that deals with another issue, namely Rob van Dorland ((KNMI) in the context of the environment and climate change (check Paris 2015). The earlier Radar TV broadcasts showed professor Arnoud Boot of the University of Amsterdam. He did not perform at this college / lecture. Boot agrees on this: the ECB is buying time with its Quantitative Easing at the rate of EUR 60 bn per month. This money only stays in the financial circuits, reduces interest rates for savers and pensioners, raises stock prices for the wealthy, and doesn’t generate real investments when demand is wanting. When economies do not redress the banks then the next crisis will hurt even more. There is a longer interview with Boot by “gold bug” Willem Middelkoop, December 24 2015. Around 2008, Middelkoop warned for an even bigger crash, set up a business advising people to buy gold and commodities rather than paper, and then sold his business. The bigger crash did not come. Apparently he still is taken seriously by some people. See my earlier discussion of the “gold bugs“. The 2015 interview with Boot shows that Middelkoop can ask some standard questions that are interesting when you haven’t heard them before. He doesn’t ask the critical ones. Boot doesn’t mind that people don’t ask the critical questions. It is informative that Boot announces that he and the WRR (scientific council) will put out a report in April 2016 about disengaging the economy from the financial sector. Hopefully Boot and WRR will look at my paper “Money as gold versus money as water” (2013). Boot however fails by not protesting against the censorship of science by the directorate of the Dutch Central Planning Bureau, see here. Dirk Bezemer (University of Groningen) started out as an economist in agriculture and development. He shifted to finance after the crisis in 2007+. This change is acceptable. Also John Kenneth Galbraith (1908-2006) started out as an agricultural economist. Jeroen Dijsselbloem, the current (financial) president of the Eurozone, is an “agricultural engineer”. While this is acceptable, the problem lies in the attitude. When Dijsselbloem gets criticism that his knowledge on macro-economics is lacking, then he should pay attention, see here. When Bezemer receives criticism that he misinforms others, then he should take notice. Bezemer drew much attention with the paper “No one saw this coming”. Bezemer here quotes Alan Greenspan, and then shows that there were warnings that Greenspan did not listen to. You might expect that Bezemer might learn from such a paper that he himself should not make the same mistake as Greenspan. You might hope that Bezemer has become very careful in listening to criticism and warnings by others. However, Bezemer does not refer to my analysis since 1990 that also warned about the risks in the current economic structure. See my 2009 memo on this. He doesn’t do anything with my email to him about this. He does not study it, he does not write about it, he does not speak about it. Bezemer deliberately blocks my analysis with a wall of silence. We are 7 years further now, and Bezemer hasn’t found time to look at an analysis by a fellow economist who worked at the Dutch CPB in 1982-1991, and who was hit by censorship and foul dismissal. This clarifies the distinction that I make between Boot and Bezemer. Both of them neglect the censorship of science by the directorate of the Dutch CPB. But Bezemer is much more outspoken about the blindness. Bezemer selected that blindness as his topic of research, and as a scientist he should look at all the evidence. It is becoming a running gag on this weblog that Bezemer disinforms others. I already reported that he disinformed Sweden in 2012 and Dutch Parliament in 2015. It is not a running gag but a serious issue. This weblog has a scientific position, and malconduct by scientists cannot be neglected. Please note that I have not been following all that Bezemer has been doing or presenting. In minute 90 Bezemer states that there is not enough communication about the issue (“Er is te weinig gesprek over.”), which neglects that he himself blocks my analysis with a wall of silence. Dutch readers may look at my evaluation of the deficient Report on Banking, written by Herman Wijffels (see below) and Arnoud Boot. Bezemer disinformed Radar TV not only on my analysis. When Klaas van Egmond made similar errors as I had warned about, Bezemer did not pass on my criticism (and did not say to me why my criticism would be deficient). Klaas van Egmond (University of Utrecht) is a food technology engineer who turned to environmental issues, who became head of the Dutch environmental planning agency (MNP), and who in the 2007+ crisis became co-founder of what they call the “Sustainable Finance Lab” (SFL) at UU. In minute 110 in the college / lecture, Van Egmond rallies against banks that sold mortgages using the argument that the economy would continue to grow and grow forever. He laments how dumb people have been in believing those banks. He laments how mean and false those banks have been, since they must have known that their story was too good to be true. However, in his own presentation (minute 45:30), Van Egmond presents a plan with “positive money” so that the economy can grow again (at least to 2050, perhaps not for ever and ever). This is inconsistent. In itself one can imagine an argument “continued growth is only possible with positive money”, but Van Egmond’s statement at minute 110 is apodictic against growth in general. Red line: growth by Van Egmond, Source: Radar TV minute 45:30. More fundamentally, the “positive money” plan that Van Egmond presents suggests that the government would have billions from seigniorage to spend on public goods (perhaps even thirty billion). He suggests that this seigniorage is currently appropriated by banks. However, as I wrote him, he neglects both the proper value of the velocity of money and transaction costs. The payment system does not come for free. See my paper “Money as gold versus money as water” (2013) for an indicative calculation that seigniorage would be needed to cover the costs of the payment system. Unless you want to pay a percentage at each transaction, of course. What is flabbergasting is that Van Egmond in an email acknowledges that he disinformed Dutch Parliament in 2015, but he still repeats the same disinformation at Radar TV in 2016. In this email he states both that he caused confusion for Parliament, and that a velocity of money of 1 (stock of money M = P Y / V = P Y = nominal national income) needs “careful attention”. Either this “careful attention” is a diplomatic rephrasing of “oops, this was a serious mistake” or he really doesn’t see the issue even when it has been pointed out to him: but in the latter case it is not clear what the “confusion” would be. Overall, Van Egmond disinforms Radar TV that above growth path would be feasible in the manner that he dreams up. PM. There is the following curious issue. In the real-time broadcast Van Egmond stated that no economist had seen the crisis coming. I could not find this statement in the online version. Has it been edited out, or did I not search well enough ? In the session at Parliament, Van Egmond stated the same, and he quoted the paper by Bezemer as if this had shown that no economist had seen the crisis coming. The session at Parliament showed that Van Egmond hadn’t read Bezemer’s paper and misstated its summary. Perhaps Bezemer now protested, and Radar TV allowed Van Egmond to delete the passage ? The UU “Sustainable Finance Lab” (SFL) has been created by Klaas van Egmond and Herman Wijffels. At some time Arnoud Boot joined up. Van Egmond & Wijffels create the image as if they are supportive for the environment but critical of banks. Klaas van Egmond, however blocked Hueting’s analysis on the economics of the environment. Wijffels is a former CEO at RABO Bank, guilty of the same behaviour as banks in general, while Wijffels himself turned RABO Bank from a co-operative into the competitive bonus-driven bank that contributed to the LIBOR scandal. A diagram of the relationships may help to better see the abuse of science at Utrecht University. One would think that Dutch people are interested in rising sea levels. If there is one nation other than the island nations that will drown, one would expect that Holland would pay keen attention to Climate Change. Instead, Holland appointed Klaas van Egmond to become director of the Dutch environmental planning bureau (MNP). Van Egmond blocked the analysis by Roefie Hueting on environmental sustainability. See my earlier weblog text on Hueting’s analysis. In that same email of November 18 2015, Van Egmond argues that he didn’t see anything in Hueting’s analysis after “careful consideration” (my translation into English). However, Van Egmond never published what those “careful considerations” were. Thus he blocked a scientific discussion on those, and swept the issue under the carpet. In the email he states another apodiction: as if we cannot assess environmental damage. This runs counter to economic theory that policy better be formulated with the best information available. You may not like the quality of the information but it still is the best available, and you can at least try to handle the uncertainties as best as possible. Engineers like Dennis Meadows and Van Egmond, who use “system dynamics” developed in engineering, for which economic theory is a distraction. This was used by the Club of Rome report that neglected price developments and such (so that many economists lost interest). The model that Van Egmond tries to use at “Sustainable Finance Lab” (with above misleading diagram on growth) is from this type of research. Mathematicians like Georgescu-Roegen start with thermodynamics and entropy. Obviously entropy is a key notion in physics, but as long as the Sun keeps emitting light then Earth has an inflow of energy, and this approach on entropy may be abstractly correct but is not immediately relevant in terms of economics. Fleeing from Europe, Georgescu-Roegen came in the USA and they might have given him a professorship in statistics but they gave him erroneously a professorship in “economics”. There is a curious role by Herman Daly who had a B.A. and went directly to a Ph. D. in “economics” with thesis supervisor Georgescu-Roegen (see here). Daly continued with what is called “ecological economics” but which is not really economics. The field florished for a long while because mainstream economists were not so much interested in the environment. The basic idea by SFL seems to be that the current structure of finance causes insustainability both for finance and the environment. This is a nice slogan that combines two topics that are somewhat popular. There is no proof for that slogan however. It is somewhat curious to link the notion of an insustainable financial debt to the issues of environmental sustainability. It makes more sense to regard the two subjects separately. See Hueting for the environment. See DRGTPE for finance, with updates in “Common Sense: Boycott Holland” (CSBH) and “Money as gold versus money as water”. A final Radar TV “expert” is Gerhard Hormann, urban planner and political scientist, who advised people before the 2007+ crisis to get rid of their mortgages. Hormann did not discover the risk himself but was alerted by a book by historian Eric Mecking. Perhaps it is useful to look at this connection later on, and see how Mecking and Hormann react when they hear that they have been disinformed by economists Wijffels, Boot and Bezemer. The anatomy of Holland shows a morass fitting for a delta. It is encouraging to hear that Bezemer agrees that there is not enough communication and that Boot is working on yet another report on the banks. The issue will remain in people’s attention, perhaps till the delta is flooded by rising sea levels. It still is useful to boycott Holland till the censorship of science since 1990 by the directorate of the Dutch CPB is lifted.